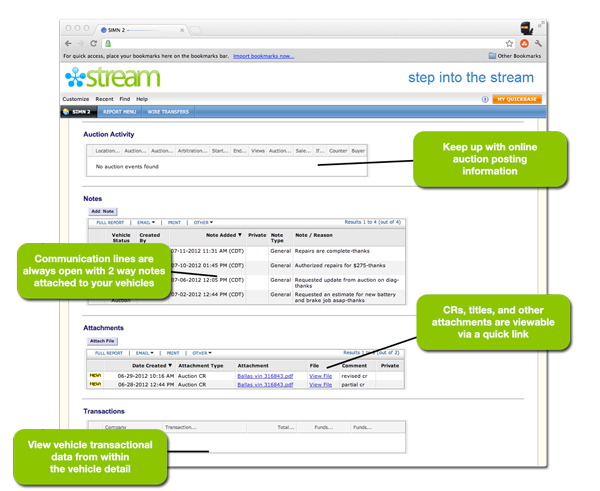 The Stream Inventory Management Network (SIMN) is a powerful and efficient inventory management tool that allows our clients to have a real-time flow of vehicle information at their fingertips. Our years of experience in the remarketing industry steered our development of SIMN. We believe that SIMN will greatly enhance your user experience and minimize the amount of time you spend managing your vehicle inventory. SIMN allows our clients to efficiently manage their vehicle inventory. This efficiency helps reduce the days required to sell vehicles while increasing dollars returned to our clients. 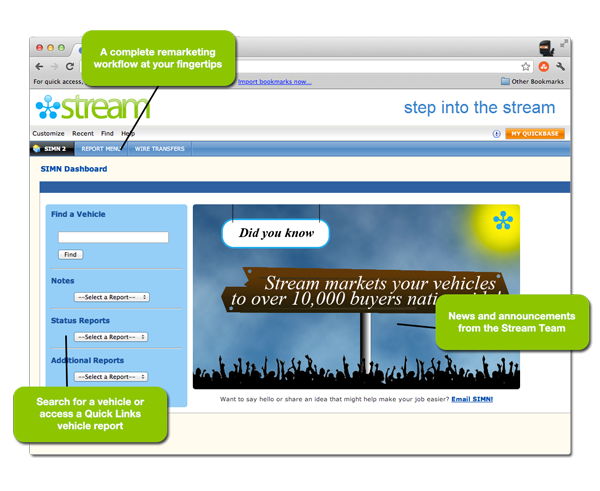 The SIMN dashboard gives you quick access to the most common user reports, vehicle search, and news from Stream. Our technology helps you efficiently manage your inventory and streamline your remarketing process. SIMN’s robust vehicle detail screen grabs the most important vehicle data and displays it within a single vehicle detail screen. We’ve taken it a step farther and included the ability to hold/unhold a vehicles, add notes, update floor prices, follow auction postings, and view inspections without leaving the primary vehicle detail screen. With SIMN you’ll never wonder what’s going on with your vehicles. All of your remarketing information is at your fingertips 24/7/365 with notes, transactions, and other viewable attachments available to you whenever you need them.